Sgt. Wing Woo was seriously injured in an accident on 6/24 while vacationing with his family on Maui. Wing and his 14-year old son, Tony, were body surfing when he was hit by a large wave. He hit his head on the ocean floor sustaining life threatening injuries. Wing was knocked unconscious before being found by his son moments later, lifeless and unresponsive. When pulled from the water by his son, lifesaving efforts began immediately. Wing had no pulse and had, for all intents and purposes, drowned. Wing went into full cardiac arrest during CPR. After several minutes they were able to get a pulse. He was transported to Maui Memorial in a coma. Wing had ingested a considerable amount of sand and seawater, which quickly became the emergent threat to his life. Due to his extremely unstable condition, the doctors were not able to perform additional necessary testing until three days after the initial accident. Wing remained in a coma until Monday, June 27th. When he was considered stable enough to breathe on his own for the duration of the 45+ minute MRI, the tests were done. The MRI showed brain activity and good heart condition. However, it also showed considerable swelling on his spine. At this time, Wing has limited mobility below the neck. The full prognosis regarding his movement is unclear at this time. 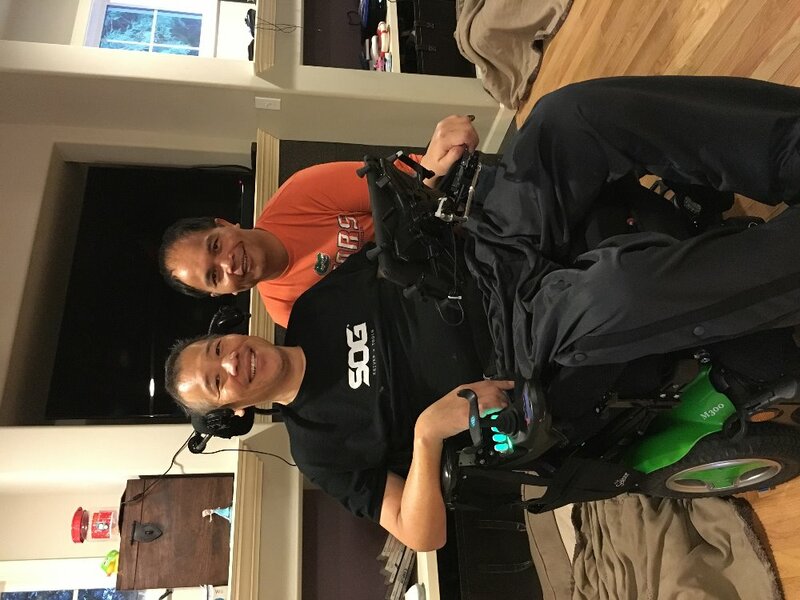 What we do know, is that we need to bring Wing home to Seattle to receive the absolute best care possible for his spinal injury at Harborview Medical Center. The costs to bring him home, due to the extensive care he will require enroute, is approximately $65,000.00. In addition, there will be countless medical expenses unpaid by insurance throughout the long road he and his family have ahead of them. At this time, Medivac is requiring a guarantor to the initial $50,000.00 prior to takeoff from Hawaii. Without that, they will not fly him out. Sgt. 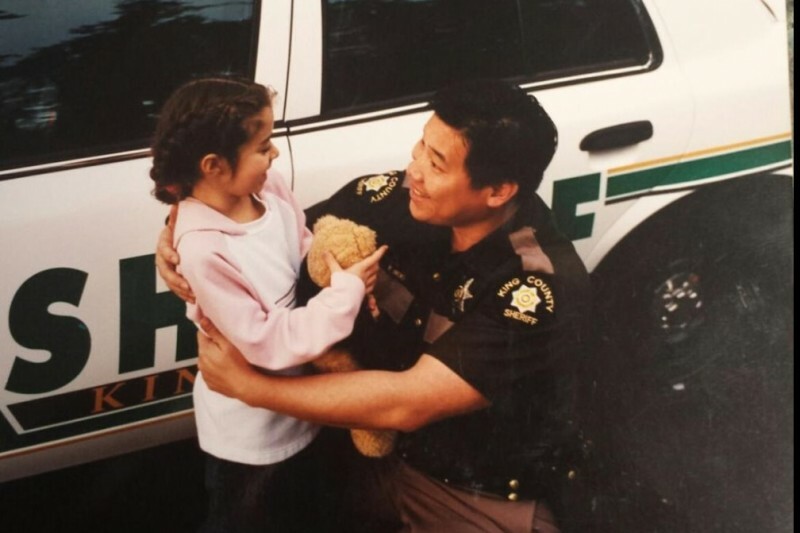 Woo has been serving the public with the King County Sheriff's Dept. for 32 years. He is married to Jackie and has two beautiful children, a daughter who is 12 and his son who is 14. Wing's mother-in-law, Catherine Marino, will be facilitating this fund for Wing. From all of his family, including those in Blue, thank you so much for your donation. It means so much to be part of such an amazing extended family. Thank you all, from the bottom of our hearts. My husband and I had the opportunity to spend several hours with Wing and Jackie this past weekend. Jackie’s quiche and Kahlua Cream pie were amazing, but the best part was seeing firsthand the progress Wing is making, as well as the upgrades taking place in their home! They asked that I share with you where they are in their quest for full mobility for Wing. With never-ending battles with the insurance company, Wing had to choose between outpatient therapy and in-home therapy. Wait, What?! Ultimately they have chosen for the insurance company to cover the intensive outpatient therapy as the cost is higher. However, that leaves them paying out of pocket approximately $1800.00/month for therapy in the home. Currently Wing goes every Tuesday and Thursday to the University of Washington for two hours each visit. He receives both occupational and physical therapy. Monday through Saturday there is a CNA that comes to the house and assists with physical therapy. It is awesome that Wing is FINALLY receiving some level of therapy 6 days each week on a consistent basis! In addition, they are in the process of expanding a small bathroom on the main level and installing a shower for Wing. Since coming home, he has needed to go across the street and use a neighbor’s shower. 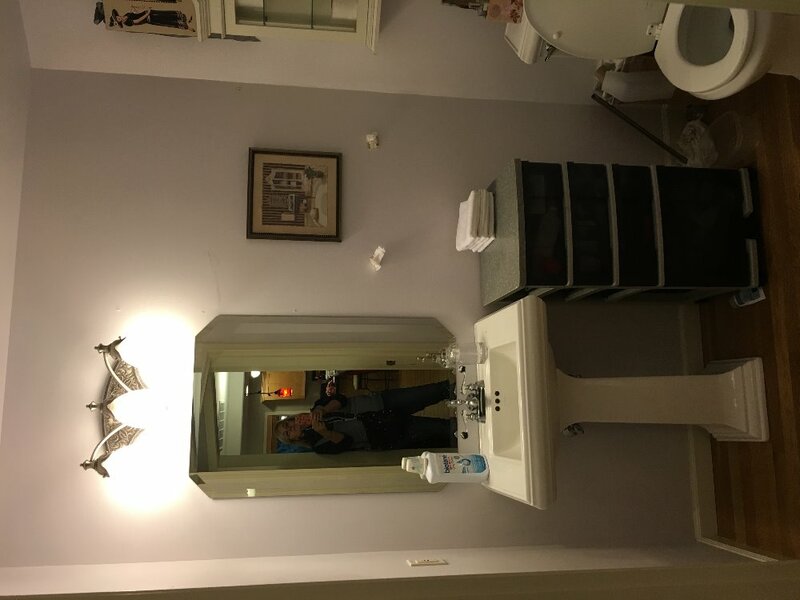 I’m including a couple of pictures to show the bathroom project. 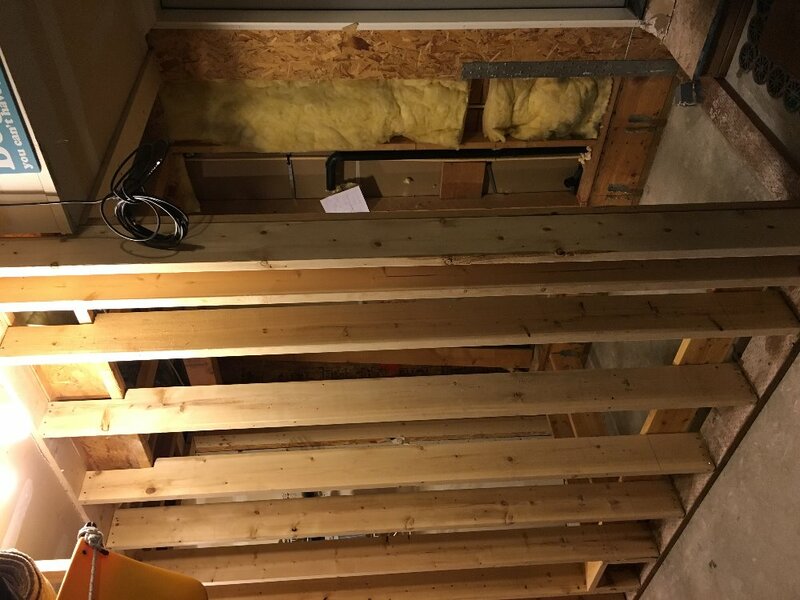 You will see the small bathroom and then the framing for the extension. The other picture is of Wing with his friend Moe, who visits regularly. Moe was Wing’s favorite nurse during his time in Harborview. Wing continues to struggle with mobility on his left side, but is working hard to increase it. He is able to lift both legs now, and told me he could even kick me with his right leg if he needed to. Ummmm, I think I'll take his word for it. LOL. His attitude and sense of humor are inspiring! He is determined to kayak again one day in Puget Sound. I have no doubt he will! My last update let you all know that Wing needed to purchase a mobility van. They have located a van that will be perfect, but it has a recall issue right now that is preventing them from actually purchasing it. It sits at the dealership waiting for that to be resolved. Hopefully it won’t be too much longer. In the meantime he is utilizing both King County Access and Snohomish County D.A.R.T. for his transportation to and from therapy. Wing and his family wanted me to thank each and every one of you for your kindness, generosity and prayers over these past 7 months. It has been a difficult and challenging journey for them and there is much work to be done, but they continue to face the challenges head on and are thankful for every sign of progress along the way. Thank you and God Bless. and Kersey Mobility (kerseymobility.com), the family hopes to get Woo out of the house and on the road before the end of the year. If you are able to help Wing raise enough money to offset the cost of this much needed mobility van, it would be greatly appreciated. Jackie shared with me that last week, after being pulled to his feet, Wing was able to stand in place for 7 minutes! He has also continued making progress with movement on his left side. While Wing continues to fight for every inch moving forward, let's give him the tools needed to get there! Thank you for your prayers and support. They mean more than words can express. The Woo Family would like to wish you and yours a wonderful Thanksgiving! 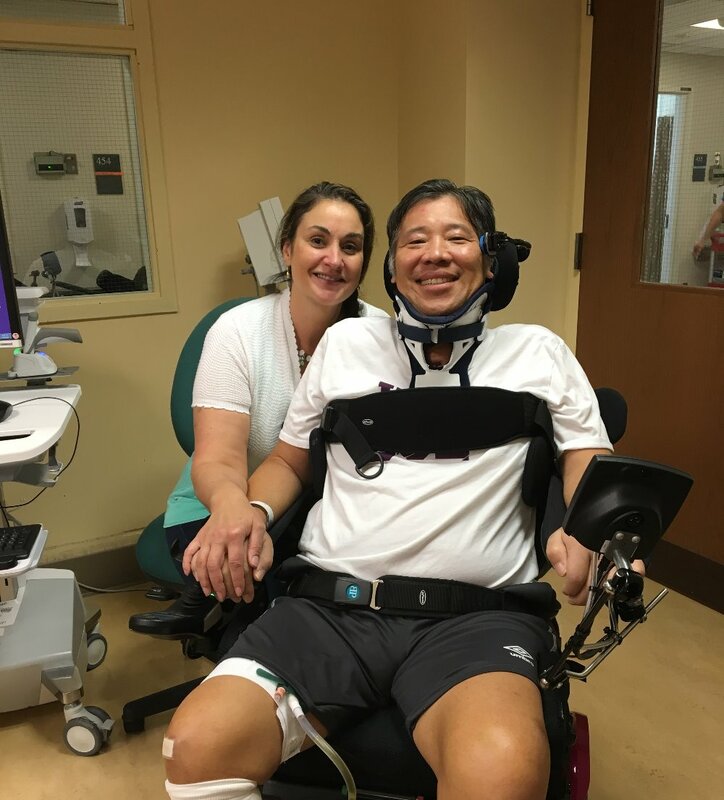 I spent several hours last night with Wing's wife, Jackie, so that I could provide an update on Wing's condition and where they are with his recovery. The update was both disheartening and uplifting at the same time, if that's possible. Wing has been transferred twice in the last three weeks to two different care facilities. Unfortunately, neither has provided the level of care needed and, in some cases, not even the most basic of needs were met. Thanks to many wonderful people donating their time, the ramps are in place, th e doors have been widened and now they want to bring him home. However, the reality is that Wing needs to be at a facility for continued rehabilitation to prepare him of his new life at home. Insurance is refusing to pay and the Wings are forced to pay out of pocket for the current facility. Unfortunately, that is just one of many battles with the insurance company. I can’t even begin to tell you the nightmare story of the insurance failure from start to finish. Not only are they fighting for every ounce of physical progress for Wing, but are forced to also battle the insurance company at every single turn. Jackie shared how they denied the appeal for the medivac; they have denied various pieces of equipment along the way pertaining to his wheelchair and they have denied equipment needed to care for him at home. BASIC equipment needs such as the full electric bed and the hoist needed to move him from the bed to the chair, or the chair to the shower stall. The list goes on and on and on. The insurance company appears to be operating from a standpoint of forcing every claim to be appealed by either Jackie or the care provider. That, in and of itself, takes a considerable amount of time and energy. Let’s face it, they don’t have much of either these days. Wing has dedicated over three decades to his community and certainly has paid for insurance all along the way. Yet when a tragedy strikes and he needs to actually use the insurance he has paid for his entire adult life, it has failed him and his family! Unbelievable. Jackie asked for a special thank you to Robin Blahous, Phil Borgnes and Jake Bergevin for organizing the student’s movie night at Edmonds-Woodway High School to raise awareness of the fundraising efforts on behalf of their family. Please continue to share Wing's story and to support whenever possible. Your generosity and support continues to be such a gift to Wing and his family. I know many of you have asked for more frequently updates, but trust me, progress is slow and, while there is much going on in the background, we need to allow time to do what it does best. Stand by though, my husband and I are visiting Wing tomorrow and hope to have an update next week totally focused on his progress! 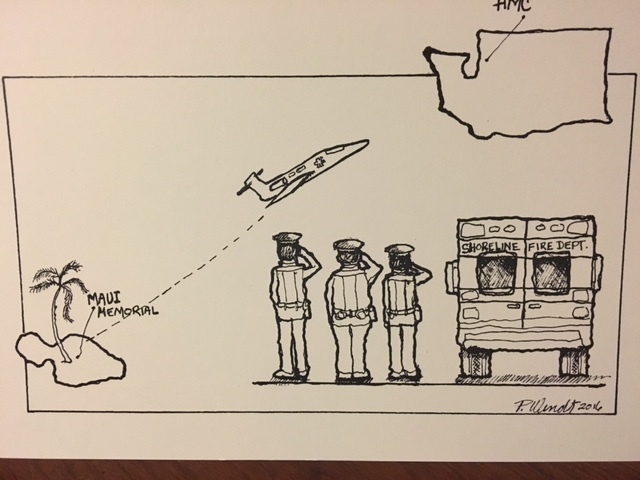 The attached picture was drawn by Pat Wendt, a very close family friend who has known Wing for many years. I loved it and thought you would too. I wanted to share some highlights from our visit with Sgt. Woo yesterday. It was clear that Wing does not take himself too seriously and that the accident has not hampered his sense of humor in the least bit. He had us laughing the entire time while recounting his antics with the nurses and student nurses at Harborview. When not in therapy, Wing wheels his chair around the floor and visits others who have suffered similar injuries, providing encouragement and no doubt laughs as well. He continues to show progress with mobility and has even begun to regain some slight movement on his left side, while continuing to strengthen his right side. 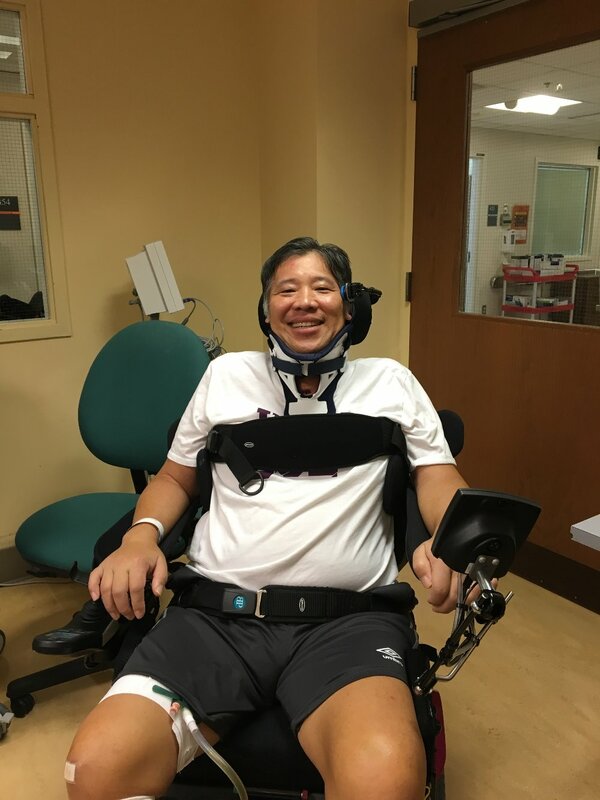 Wing is motivated and determined to walk again and seeing how hard he is working, we have no doubt he will. He is thankful for the wonderful therapists who work with him during his many hours of grueling therapy daily. Not surprising, Wing has met all the initial goals set for him by his therapy team and is working on the next . He is expected to move to an interim rehabilitation center at the end of the month before eventually returning home. Meanwhile efforts are underway to make the conversions and modifications necessary at home to accommodate his wheelchair and other equipment so that he can continue therapy there. The cost of his care and the expenses of converting his home would be unimaginable and overwhelming were it not for all of you . Wing and his family are so thankful and appreciative for your continued prayers and support. I remember his first day at Pct 3. Green kid. He has turned out to be a great law enforcement officer. King County and Shoreline are lucky to have him. God Speed, Wing. I've known Wing all of those 32 years with King County. A truly great man! I can offer prayers until payday and I'll be back. Hang in there Wing. Miracles do happen and I pray for your full recovery! You can do this! I remember Sgt Woo as my DARE officer as a kid! Such an icon for the Seattle/Burien area. Prayers to him and the family for a safe return home to WA and a speedy recovery. Can someone tell me if Mr.Woo patrolled the Burien area in the 80's? Contact James Shepherd at the Shepherd Center for Spinal Cord and Traumatic Brain Injury in Atlanta, GA. He had the same injury while surfing and may be able to help you. One of the best spinal cord injury treatment centers in the U.S.
My dad worked with Officer Woo at the Burien Precinct years ago. He always had great things to say about him. Praying for a full, quick recovery and peace for his family throughout. Thoughts and prayers from here in Idaho!!! Wish I could donate. But you are in my thoughts! !Best wishes!! While I'm not able to give financially @ this time, I am praying for Sgt. Woo & his family! All my thoughts, prayer & love are sent your way as well as all my graditude for your service! I have shared this page on my Facebook, my brother n law is a deputy sheriff so I understand the sacrifices Sgt. Woo & his family have made. God bless him & his family! Sgt. Woo, you are one of our own in Shoreline, and as I scroll down the list of donors, it warms my heart to see so many people and businesses have stepped up to make sure you are coming home, and will be getting the best care at Harborview. Our Shoreline firefighters will be there to get you from the airport to the hospital. All our prayers to you for a speedy recovery and to your family for all the support they need. It warms my heart to see the public at large come together to support this family. Love pervails. Sending prayers to Sgt. Wing and Family. God speed! Thank you for everything you have done for our communities. Get back home and get well soon! Positive thoughts to you and your family during this time. Here's hoping your community can reach the $250K goal needed by the family for your continued recovery & care. So sorry to hear about your accident, Sergeant Woo. Hope to see you back in the neighborhood soon, working with the people who appreciate you around town. Much can be done from a mobile unit! God Bless.